Winding residential torsion springs is dangerous. If you are not careful, and if you do not have the proper tools, it is easy to get hurt. 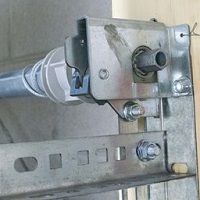 To make the process safer for DIYers, a number of garage door manufacturers have developed their own spring winding systems. Below are the more common ones. There are two types of winding units for the Wayne Dalton Springs: the original TorqueMaster I system, and the newer TorqueMaster Plus, also called the TorqueMaster II, system. In each system the spring or springs mount inside a metal shaft and the winding units mount at the very ends of the shaft to the vertical jamb and flag angle. TorqueMaster I. The winding unit for the original system contains gears that are wound using a drill with a 7/16” socket or nut driver. 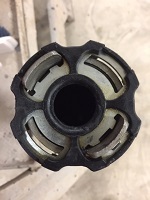 The teeth of the drive gear secures the winding cone. The spring winds as the winding bolt turns the worm gear, which turns the drive gear. A numbered wheel on the unit indicates the number of turns on the spring. TorqueMaster II. The TorqueMaster Plus winder uses a ratcheting system and a 5/8” socket to wind the springs. The gears turn the winding cone at each end and the ratcheting mechanism holds the spring tension. There is no wheel to record the turns. Installers mark the shaft or socket to count the number of turns. 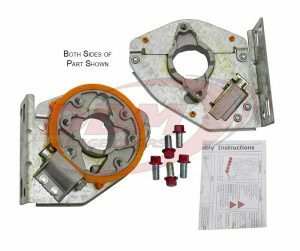 Here are some additional helpful links: Wayne Dalton Garage Door Parts, Wayne Dalton TorqueMaster Torsion Springs, TorqueMaster Torsion Spring Replacement, How to Unwind TorqueMaster Plus Springs, and How to Wind Torquemaster One Springs. This system requires gapped torsion springs that mount on the outside of the shaft. 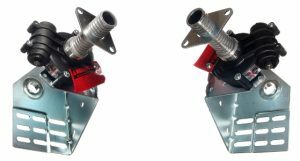 The winding units mount next to the cable drums on an end bracket that bolts and screws to the jamb and end plates. The winder cone slides into the winder and the opposite end secures to the shaft with set screws. After the spring cones are secured, tension is applied by turning the winding screw with a drill. 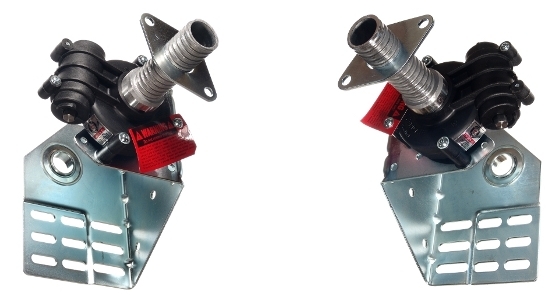 The ATL winder mounts near the center of the shaft and functions as both a spring anchor bracket and spring winder for standard residential torsion springs. The stationary cones secure to the spring winder and the winding cones secure to the shaft with set screws. The springs must be stretched before tightening the set screws. Once the spring is stretched and the set screws are secured, a drill is used to turn the tensioning screw and wind the spring or springs. Only standard residential torsion springs and standard lift drums are compatible with this winder. You’ll find Instructions for Installing Arrow Tru-Line Winders on our ATL Winder page. Similar to the other winders these mount near the ends of the spring shaft and they are bolted to special end bearing plates. The winder end of the spring secures to a steel plate mounted on the winding unit shaft. The cone at the other end is secured to the shaft with set screws. The springs must be stretched before being wound. 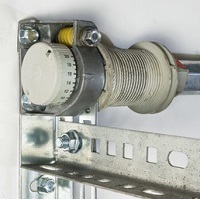 The distance of stretch is based on the spring’s wire size and the door height. Turning the winding screw rotates the winding unit plate and thus pulls the steel plate closer to the winder. Once the plate meets the winding unit, the spring starts to wind. These units work only with standard residential torsion springs and cable drums. As with the other winders OHD the left wind spring mounts to the left end of the shaft and the right wind spring mounts to the right end. Unlike most of these systems, each spring mounts inside its own aluminum tube – thus the name “ARMOR”TITE. The tabs of the stationary cones secure into the cable drums and the tabs of the winding cones secure into a retaining plate. The outer shape of this plate matches the indentations in the aluminum tube which is secured to the winding unit. The winding unit mounts on the end plate and to the inside of the cable drum. To wind the spring, a retention pin must be removed from the winder and the winder must be turned clockwise using a hand drill with a 5/16” Allen hex bit. Instructions for this equipment begin on page 28 of the Overhead Door Residential Installation Instruction Manual. Standard torsion spring systems are the least expensive and they provide the most options. However, they are also the most dangerous. That’s why winders were developed. When selecting a winder system to convert from extension springs or from standard torsion springs to a spring winder system, there are several factors to consider: quality, material cost, shipping cost, amount of work, adaptability to jackshaft operation, and the ability to upgrade the cycle life of the springs. We do not recommend converting to the Wayne Dalton TorqueMaster System because of the material and shipping costs. These start at $250 to $300 for a single car door and, because of special crating and over the road shipping, prices start from $600 for a double car door. Cycle life options are also limited, and these are not readily adaptable to jackshaft operation. Nor do we recommend converting to the Clopay EZ Set System. This is because the winders are made of plastic and we’ve seen a lot of problems with those over the years. The specially gapped springs with special spacers also cost about twice as much as the standard springs, longer life options are limited, and jackshaft openers can not be installed on them. We don’t recommend the Overhead Door Armortite System because of the cost, and because of the difficulty of installation. These systems are jackshaft operator compatible. We usually recommend the Arrow Tru-Line Winder. It is usually the least expensive, it usually requires the least amount of work, and it allows for installing any of the longer life torsion springs we provide. There are two disadvantages. One is that the springs have to be stretched before winding. This can be challenging when the wire size is larger than .250. In addition to this, with the ATL Winder you can wind and unwind the springs a total of three times before you risk damaging the gears. Normally this will not be a problem. These winders are jackshaft operator compatible. The Spring King / Simple Set Winders are the only other winders we would recommend. 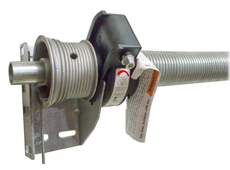 This system allows for installing any of the longer life torsion springs we provide, and, for a single spring system the cost is actually a little less than the cost of the ATL Winder. On a two spring system, however, the cost is almost twice as much. Installing these may also be a little more work. The two advantages over the ATL Winders is that the Spring King Winding System stretches the springs for you, and there is no limit to the number of times you can wind and unwind your springs. These winders are also jackshaft operator compatible.